Janet now has her own furniture, and it is finally time to show her off in all her finery. For those of you still wondering... no Rona, she's not an illegal immigrant from eastern europe with an extremely large tush... she a second hand Handi-Quilter frame. A few years old so not the latest model, and not a long arm which was the other most common suggestion... that would have been way outside our budget - but my Brother Innovis sits happily in the tray, and whizzes backwards, forwards and sideways - OK my 8 1/2" throat space could be an extra few inches bigger but it will do. I appreciate the limitations of these sort of gadgets, and approach the purchase the same as buying a new tool... it simply gives me a larger range of options. 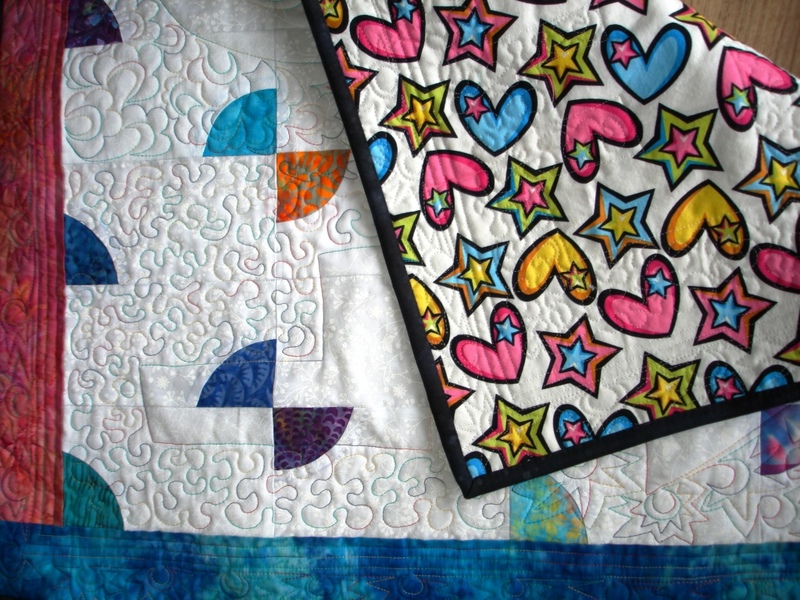 I am looking forward to basting with water soluble thread and machine quilting on my normal machine as per normal - just without pins! I really hope this works as I won't have to crawl around on the floor anymore. The tools came out, and there was plenty of noise and sawdust... I knew it was serious! And this is the garage space that will one day be finished off, beautified and turned into my studio space. One day when my kids are a bit older and more responsible... I'll be able to disappear into my studio and create. Until then, I still have my sewing space set up in Nadia's bedroom. It works. But I sure do have huge dreams about this new space - some of which include walls, carpet and lights! 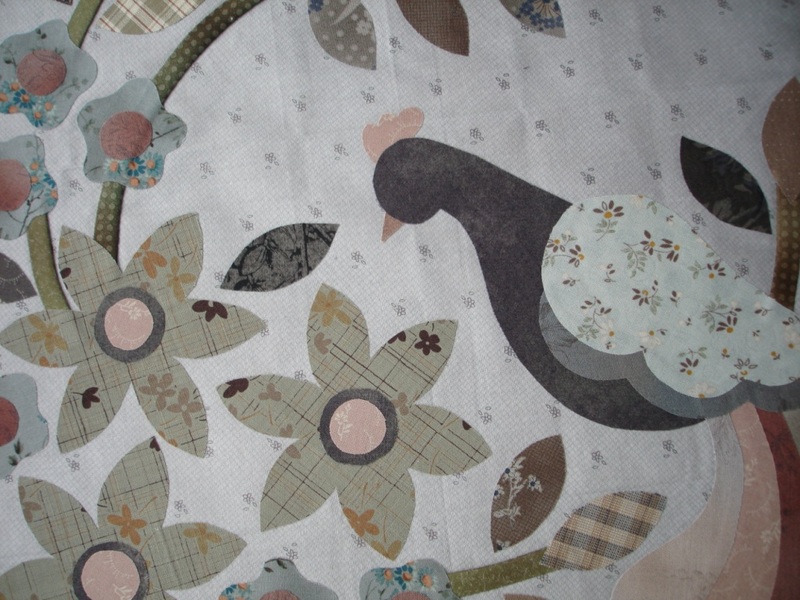 And talking of Nadia's winter quilt... border all finished... ready to go. Have I finished my April Swoon block? Not yet. Have I finished the blanket stitch on My Tweets Block 2 & 3? Not yet. Did we have a lovely family ANZAC Day? YES! I heartily recommend the Monopoly version which has EFTPOS card - great fun. We are all having a little bit of chill out time throughout these school holidays. This means I get to sleep in a little bit, read my book when I want to, and sew when I want to. Or at least that's the plan. I finally finished my Swoon Block Number Three (this was supposed to be the March block - whoops) and started cutting Block Four for April at the same time. 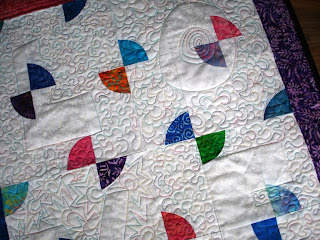 Have I mentioned before that the Swoon blocks are 24" finished? That's big. This time I experimented with some home made starch. So these plain tan units not only look like manilla folder cardboard, they feel like it too. Starch helps to keep the many seams from shifting too much as you sew - not a failsafe system, but pretty good. I'm popping the completed smaller units up on my design wall as they get sewn together. This is one block where you really need to keep an eye on placement. 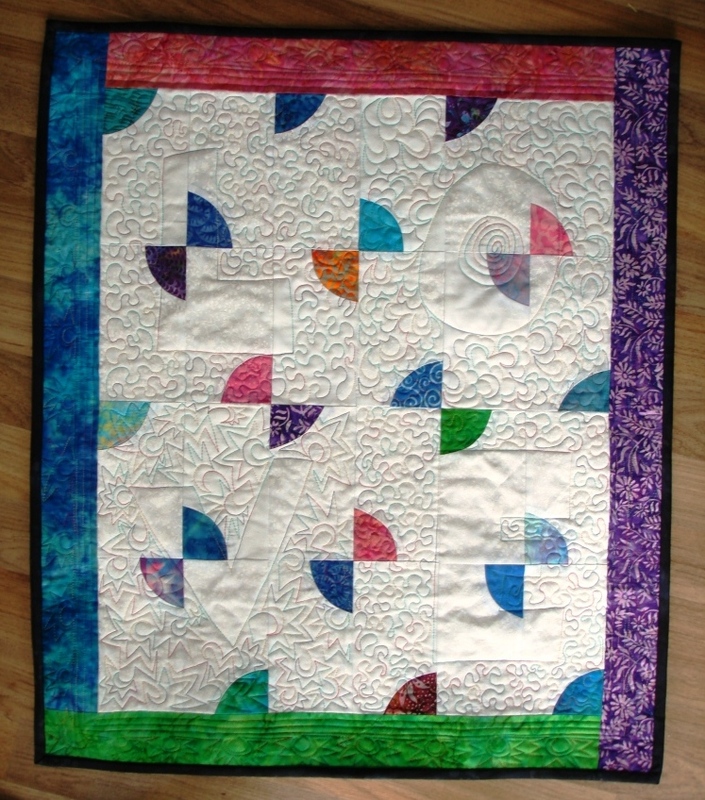 Friday quilting with the ladies yesterday, meant a bit more progress on my Gail Pan B&B BOM - see, it's getting bigger. I really should have cropped this photo shouldn't I? 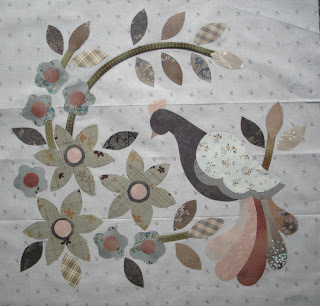 I've got all the applique components finished, just need to sew them together for a finished Block Number 5. Has anybody noticed the difference between my version and the link picture at top left? You caught me, I haven't reversed my images... pure lazyness. While it may not be readily apparent, I've slowly been nibbling away at some old and not so old WIP projects. So far this year I've finished the Log Cabin Stars, Buggy Barn Courthouse Stars, Russian Nesting Doll baby quilt, Baby Quilt/Raffle quilt and the AMQG Challenge bassinette quilt. 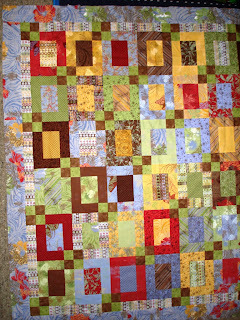 This time I've released this one from the box... it just needs the yellow border section put onto the last row, and decisions made about whether it needs a final border (now that she's got a bunk, the blankets don't need to be quite so big). A close up of the cute as fabric. Nice and girly without being too young or old. While it has been quite a while since I put this together, I hadn't remembered that this block got a mix of fabrics. Did you notice it in the first picture? Amazing how the brain reads similar fabrics as the same. I picked up the princess, stripe and green floral fabrics online through Equilter with one of their el cheapo sales. A yard each and worry about what to do with them later. A few fat eighths and fat quarters rounded it out. This explains why I didn't have enough fabric in the first place - there is something to be said for planning first, then buying the fabric. This pattern is a blown up version of another quilt top I made, and one day it will be it's turn to be finished! I have been slowly putting together some ideas for my stash of bluey/greeney with a touch of gold/mustard solid fat quarters, and have got to the stage where I would quite like to start cutting them up... but you know, while I haven't actually been that good at my resolution to only buy necessary fabric (there's been a whole lot of unnecessary going on), I have been not too bad at not starting new things. Well, apart from the challenge quilt and the Russian nesting doll quilt - but they were baby things so do they really count? With my main projects on the go at the moment, they mostly have quite subtle colour combinations - and I'm itching to do something totally bright and loud as well. Will I succeed in keeping a lid on these urges... you'll have to stay posted and see what happens. 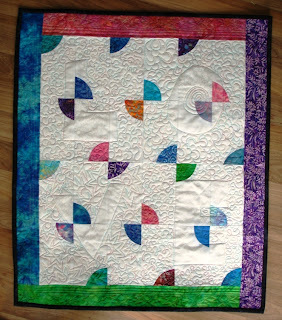 Hopefully I'll remember to link up with What a Hoot and Lee at Freshly Pieced.